If you love strolling through Reston Town Center but wish there were more independent businesses among the large chains, then you don’t want to miss one of the area’s newest stores. Living Threads Co. is all about supporting small businesses. It opened earlier this year, bringing handmade products from independent artisans to Market Street. 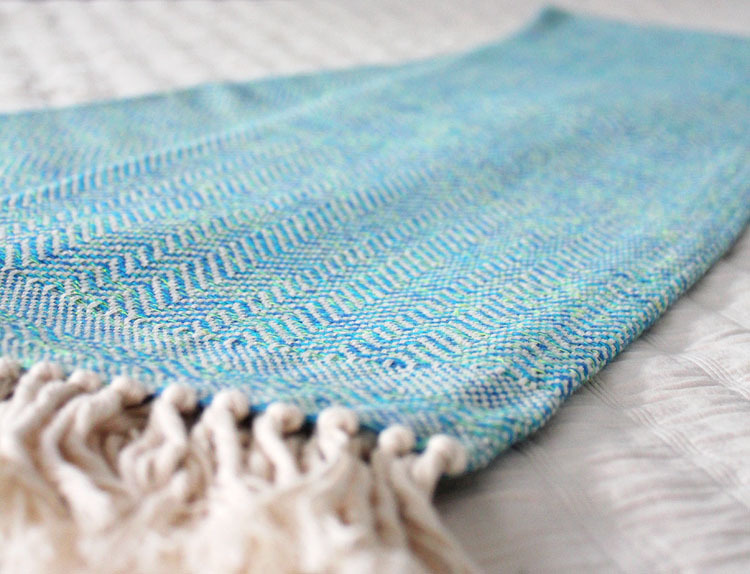 Living Threads Co. sells beautiful textiles such as blankets, scarves, and table linens. What makes these products particularly special is that they are handmade by artisans in Nepal, Guatemala, Nicaragua, and India. 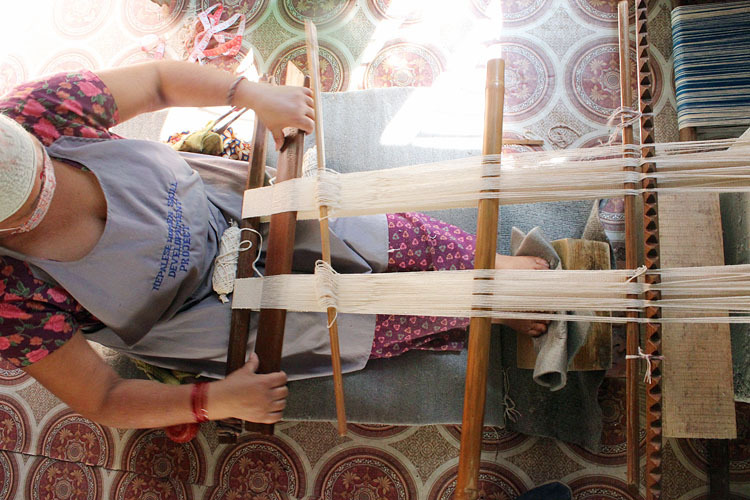 The mission of Living Threads Co. is to support these skilled artisans and their communities by connecting them with consumers. It was founded by Amanda Zehner, an international development specialist who has worked overseas and seen the challenges of many small business owners. She set out to find a way to support them while also introducing U.S. consumers with their high-quality products. I spoke with Amanda Zehner to learn more about her and her business, as well as the artisans behind it. 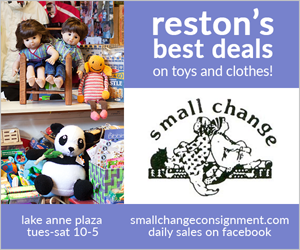 Modern Reston: Could you tell us a little about yourself and your background? 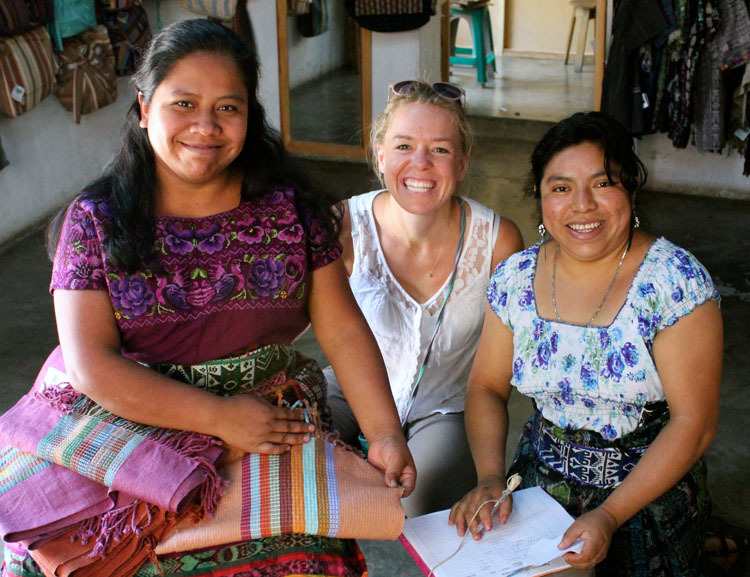 Amanda Zehner: I founded Living Threads Co. in 2014 after many years in the non-profit sector. Following graduation from Virginia Tech in 2005, I joined the Peace Corps and served as a volunteer in Western Africa for two years as a community development and health volunteer. Upon my return to America, I earned a master’s degree in International Development from Brandeis University. Afterward I became the Program Director in Guatemala for Pueblo a Pueblo, a non-profit whose mission is to improve the health, education and food security of families in rural coffee-growing communities in Latin America. Following my work in Guatemala, I joined Sustainable Harvest International, a non-profit based in Ellsworth, Maine, whose mission is to provide farming families in Central America with the training and tools to preserve our planet’s tropical forests while overcoming poverty. It was during these years living and working in Latin America and extensive travel abroad that I begin to form personal relationships with artisans. Textiles and design have always been a passion of mine despite pursuing a career in international development. As I got to know these artisans and their skill as weavers I wanted to find a way to connect them to sustainable markets, enabling them to grow their small businesses and better provide for their families while also connecting consumers to healthy, sustainable and high quality unique handmade goods. Hence Living Threads Co. was born. How did you get involved in this line of work? How did you get the idea to sell these artisans’ products? I got involved while working in these countries and developing relationships with these artisans. I saw first hand the skill and quality of their products, but also the the barriers and challenges. 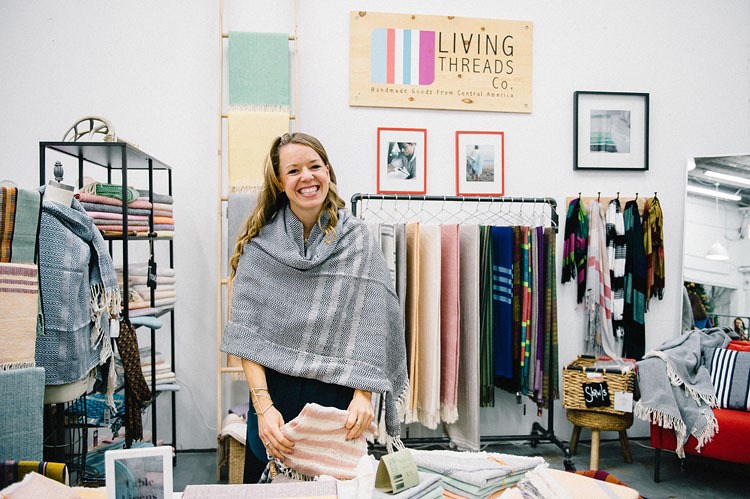 Living Threads Co. addresses the barrier to access to markets, and provides artisans with the opportunity to earn fair wages for their high quality products while also investing and building their own capacity in their countries. There is so much untapped potential in the world of skilled artisans. Not only are these families suffering because they lack access to sustainable income, but their ancient art is slowly dying. Our consumer culture and expectations of cheap goods is harmful to our planet and communities. I strive through Living Threads Co. to demonstrate that for-profit enterprise can be profitable, while also creating positive social change and caring for the environment. How do the artisans benefit from this arrangement? I purchase directly from all of our artisans and cooperatives. We strive to make consistent orders throughout the year, so that families and cooperatives have year-round dependable income to cover basic needs as well as grow their businesses. We invest in our microcredit and training program and partner with local non-profits to help provide on-going training and capacity building so that groups can build their capacity locally. We also encourage the individual creativity of our artisans and the use of traditional designs and patterns that are reflections of the culture and environment where these artisans live. In Nicaragua the average income is $1,940 a year or $160 dollars a month. Through Living Threads Co. over the past two years we have raised income of the Nicaraguan family we work with from $60-$80 a month to $300-$310 a month. They have also been able to hire five additional members of their family, thereby increasing the economic and social impact in their broader community. Please tell us a bit about the textiles you sell. Guatemalan textiles are handwoven on Mayan backstop looms, an ancient tradition passed down generation to generation for thousands of years. Cotton is locally grown, hand spun and naturally dyed using locally found plants, fruits vegetables and even insects. Designs are inspired by the culture of the Mayan indigenous with a blending of modern style. 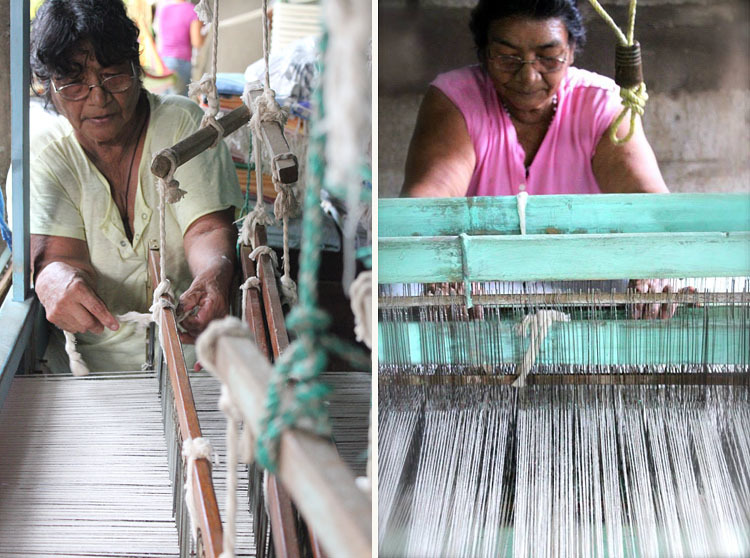 Nicaraguan textiles are woven on wooden looms hand built by the family out of reclaimed wood found around town. All blankets, throws, table lines, scarves and more are woven by hand on these large wooden looms. We have traditional and unique designs for every home. All our designs are unique to Living Threads Co. and all purchases come with a product and artisan description. We strive to connect consumers with the women and men who created their unique piece as well as the culture and art behind it. They are thoughtful, impactful and one-of-a-kind gifts for baby showers, weddings, holidays and more. 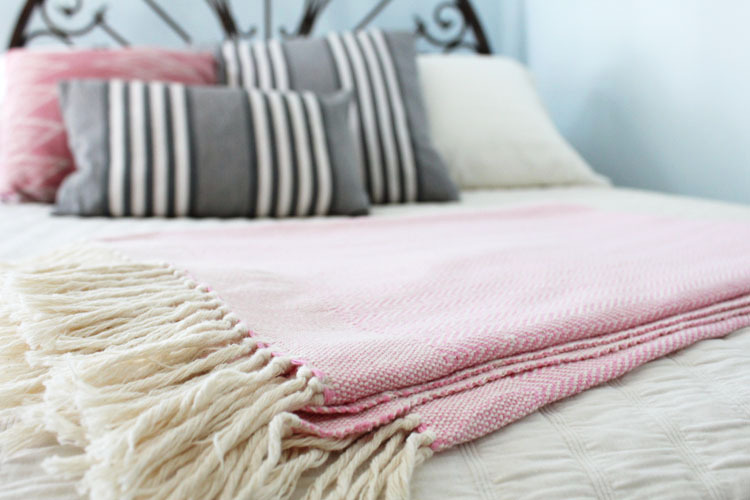 My favorite is our large herringbone blankets. They are woven by the grandmother of the family cooperative in Nicaragua and very versatile – bedroom, couch, comfy chair, kids room. They are machine washable and a great way to add a pop of color or change a room with the change in seasons. 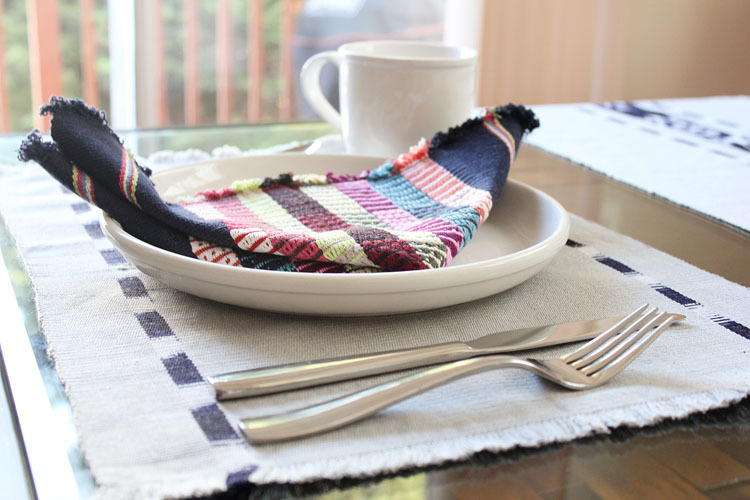 I also really love mixing and matching our placemats and napkins. Thanks, Amanda, for the fascinating look into your business and the artisans behind it. LTCo. 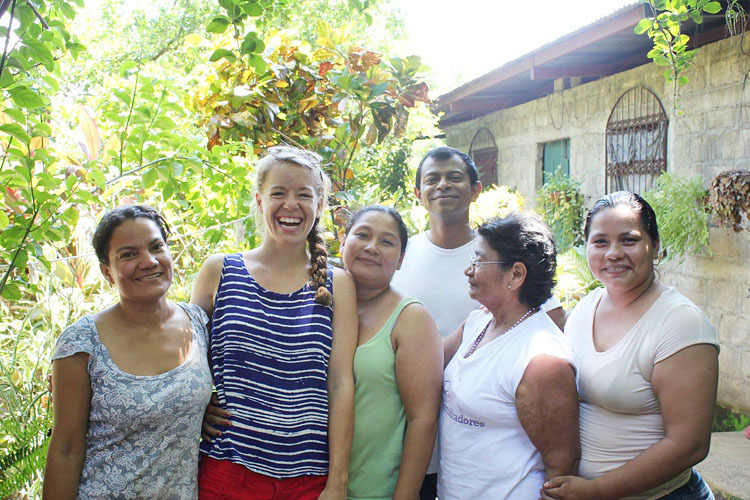 Nicaragua Family Impact 2015.08.11 from Living Threads Company on Vimeo. Living Threads Co. is located at 11858 Market Street in Reston Town Center. For more information, you can follow them on Facebook or Instagram. Photographs are provided courtesy of Living Threads Co.